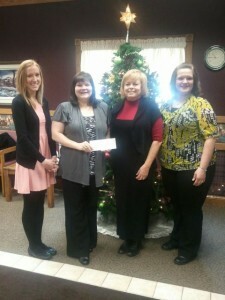 The employees of Border State Bank raised $1,200 for Hospice of the Red River Valley. The Thief River Falls branch of Border State Bank has 18 employees who raise money throughout the year through various activities. This is the fourth year Border State Bank has chosen Hospice as the recipient. The donation will be used to provide compassionate end-of-life care to those in Thief River Falls and surrounding communities. Jessica Porter, Consumer LSS at Border State Bank, said they chose Hospice of the Red River Valley as the beneficiary because of the organization’s impact on their community. “Hospice touches so many lives. We support Hospice so they can continue serving our region,” Porter said.